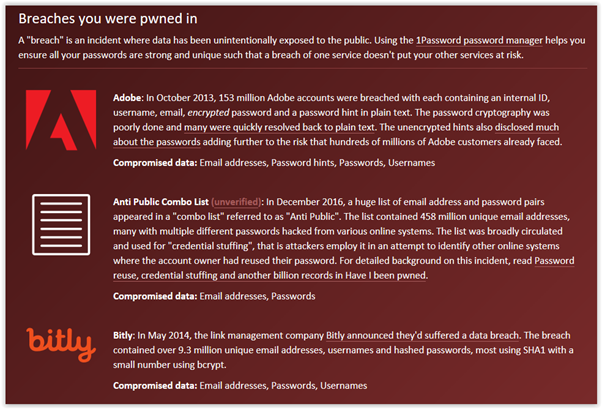 Pwned means that your account has been the victim of a data breach. It is a term that has come out of online gaming. It essentially means that someone has accessed and stolen your login details from a particular source. How do I find out if I’ve been pwned? Follow the instructions below and use an online source that will search and advise. The site will now search its extensive database of reported data breaches to cross reference your email address with those data breaches. All being well you will see a green – ‘no pwnage found’ response as shown. For many though you will see the red warning box that will show that the email address has been compromised. In the example shown the email address used has been involved in a data breach on 11 occassions. Underneath the red box you will see the actual data breaches where the user data was compromised (ie; user ids and/or passwords stolen). If I have been pwned what action should I take? You should change the password for your email address and for the service that was compromised. This is especially important if you use the same password to login to different services and sites. So, for example, if the service ‘bitly’ was one of the data breaches, change your password for your email AND for the service ‘bitly’. Also change your password on any service where you have used that same password. Remember, if you are using phones and tablets to read your email you will need to change them on here too to continue to receive your email. Use a mix of upper case (capital) letters, lower case letters, numbers and symbols for your password.